An LLC operating agreement is a binding contract between members describing how profits and losses are shared and whether your LLC is member- or manager-managed. It serves to resolve member disputes, dictate responsibilities and more. Operating agreements aren’t always required by law but have an attorney or legal service draft one to include in filing documents. 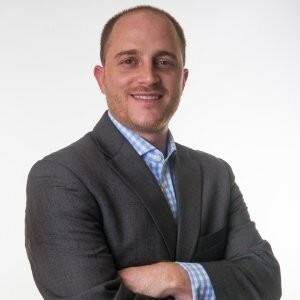 Rocket Lawyer is a good alternative to hiring an attorney to help you make legal decisions for your LLC. If you want to save money on hourly attorney fees, check out Rocket Lawyer. You can get access to operating agreement templates, document review and attorney consultations for $39.99 per month. Try it free for 7 days. This free operating agreement template includes eight articles with all of the information necessary to outline your LLC’s ownership and member duties. Important sections include your company’s management and tax structure, dispute resolution terms and other information to guide operation of your company. Use these free LLC operating agreement templates to clarify the organization of your LLC and retain control over LLC management, taxation, profit sharing and more. Single-member LLC operating agreement (.DOCX, .PDF, Google Doc): Select this template if you’re the only owner of your company. 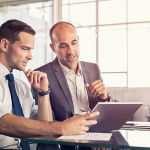 Member-managed is the most common structure for a single-member LLC, but you can also choose a manager-managed structure using the single-member template. Multi-member LLC operating agreement (.DOCX, .PDF, Google Doc): Choose this template if your company has several owners. Use the manager-managed language if your company will be managed by a group of managing members or a third-party manager; otherwise, use the template’s member-managed language. The templates above are a great starting point if you want to formalize your LLC’s management structure but don’t want to spend money using a law service. If you have a more complex company or want to ensure you’re following all your state-specific rules, you may be better served by an LLC operating agreement from Rocket Lawyer. You can get access to operating agreement templates, document review and attorney consultations for $39.99 per month. LLC members are the people with a legal ownership interest in your company. LLCs can have one or several members, and the format of your LLC operating agreement depends on this distinction. Identify your LLC’s members in the Articles of Organization you file with your state and make sure your operating agreement reflects that structure accurately. A single-member LLC is an LLC where one individual or entity owns 100 percent of the company. Operating agreements are most helpful in avoiding disputes between multiple members, but an agreement can provide benefits to a single-member LLC by overriding state default rules for how the LLC will be governed in the absence of an agreement. However, if you default you’ll have to comply with state-specific default rules regarding management and member authority. In addition to avoiding the uncertainty of default rules, having an operating agreement will help cement your limited liability status by separating your LLC from you as an individual. One of the hallmarks of an LLC is that its members are not personally liable for the debts and other obligations of the company. However, in the absence of an operating agreement, your LLC may look more like a sole proprietorship than a company with limited liability status. Use our single-member template if your company only has one member. Within the template, you’ll denote that your LLC is managed by you as a member or by a third-party manager. Choose the template language that best suits your LLC’s structure. Operating agreements are most helpful for multi-member LLCs because they set forth the ownership, management and voting structure of your company. The legally binding document reduces the potential for disputes between members by establishing each member’s authority and clarifying voting rights, profit sharing and what will happen if a member decides to leave the company. We recommend having an operating agreement for your multi-member LLC to avoid disputes between members and provide for quick, predictable resolution in the case a dispute arises. Establish the capital contributions of each member, identify voting rights and define what will happen if a member leaves the company. Use our multi-member template if your LLC has two or more members. A multi-member LLC is one with multiple owners. Within the template, you’ll denote that your LLC is managed by a member, a group of members or a third-party manager. Choose the template language that best suits your LLC’s structure. 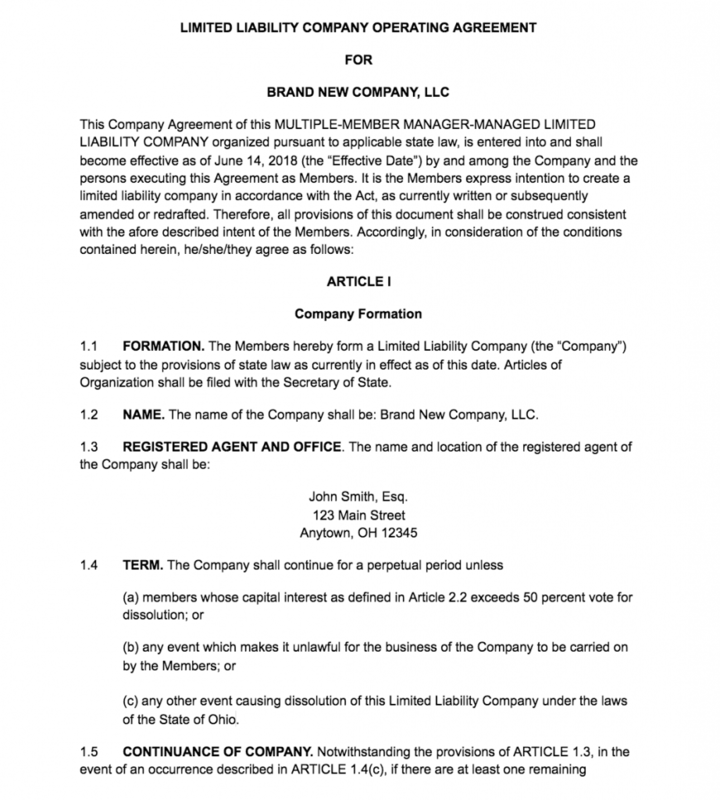 Screenshot of LLC Operating Agreement Template Intro. For more information, check out our article describing LLCs and how to file for one. If you’re ready to organize your LLC with the state, check out our guide to filing for an LLC with your secretary of state. Whether you have a single- or multi-member LLC impacts the format and content of your LLC operating agreement. Multi-member LLCs are more complicated and require sections about dispute resolution, voting rights and more. If you’re forming an LLC and need help drafting your operating agreement, Rocket Lawyer’s team of on-call attorneys can help. Once you determine your ownership and management structure, organize the details of your LLC. The purpose of Article I is to describe your LLC, so include things like your name, primary address and registered agent. Include specific details in Article I of your eight-article operating agreement to properly identify your company. LLC name: Insert the exact name used by the secretary of state’s office to identify your LLC. Registered agent: Provide the name and address information of the person or business you selected as your registered agent during formation of your LLC. Check out our guide to registered agents for help choosing one that’s right for your LLC. State of formation and primary address: Your LLC’s filing state will determine whether you have to file your operating agreement with the secretary of state’s office. Term: Maintain flexibility in your single-member LLC by enabling the member to dissolve the company at any time. If you have a multi-member LLC and want to limit when members can dissolve the company, include more specific conditions like a vote by a majority member or events making the business of the company unlawful. Continuance: State that if there is at least one remaining member of the company, that member can choose to continue the business of the company. Purpose: Include a statement of purpose in your operating agreement. Depending on your state, this statement can be very broad, like “conduct any and all lawful business” but should be consistent with the purpose included in your Articles of Organization. 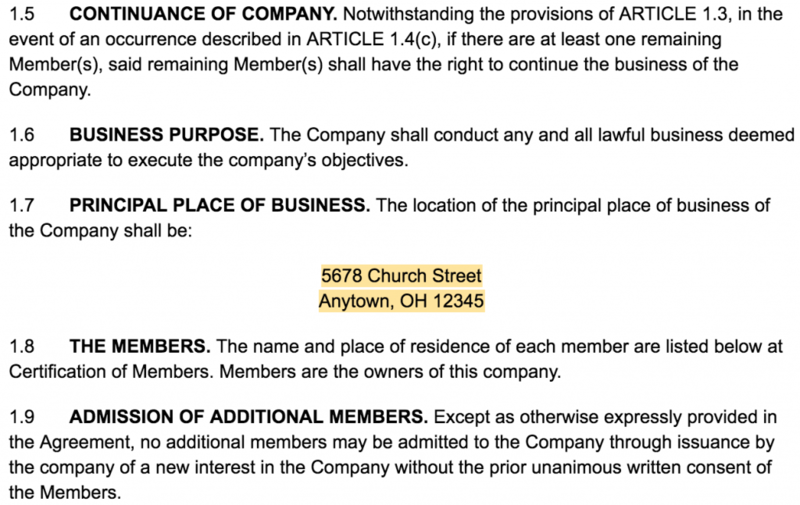 Principal place of business: Your primary address from which your LLC will operate. Some states require your primary place of business to be within the borders of the filing state, so check your secretary of state’s website for local requirements. Member name(s): Members are the owners of your company. Identify one or more of your members to begin your draft of the operating agreement. How to add members: In this section, describe how new members may be admitted to the company. For example, you may specify that no members can be added without the unanimous written consent of the existing members. 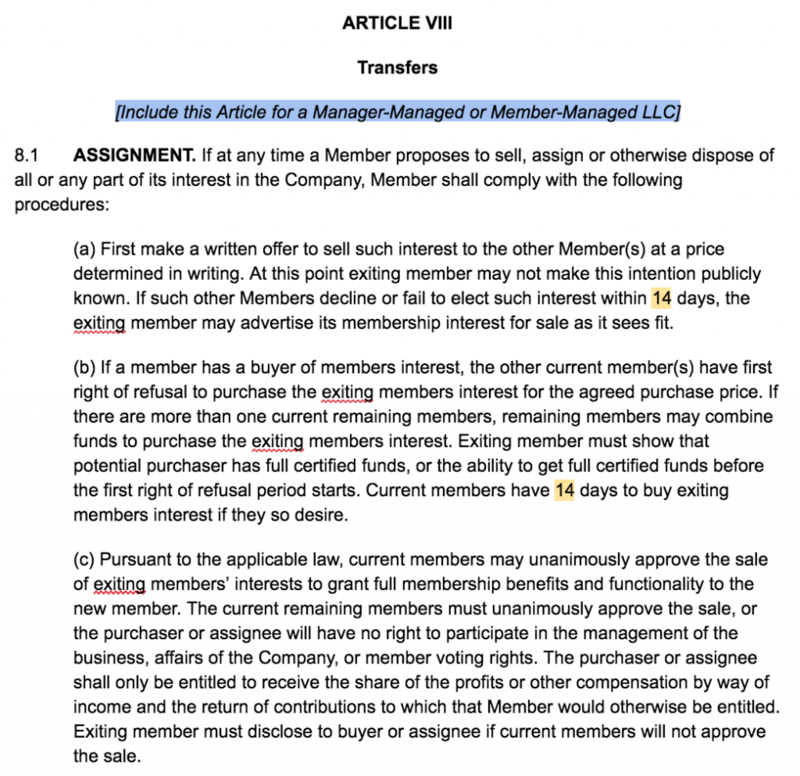 Screenshot of LLC Operating Agreement Template Article I. Initial contributions are the cash or property each member contributes to the LLC at formation. Record each member’s contribution in the operating agreement and, where appropriate, identify their percentage of ownership in the company. Generally, describe the total contributions in Article II of your operating agreement and list the detailed contributions in an exhibit. Screenshot of LLC Operating Agreement Template Article II. Generally, initial contributions are in exchange for a portion of ownership in the company. A contribution in exchange for ownership is called a capital interest and is typically equal to the percentage of the company a member owns. To complete this portion of the operating agreement accurately, include the total amount of each member’s contribution and details about how it’s allocated in an exhibit. Screenshot of LLC Operating Agreement Template Exhibit 2. 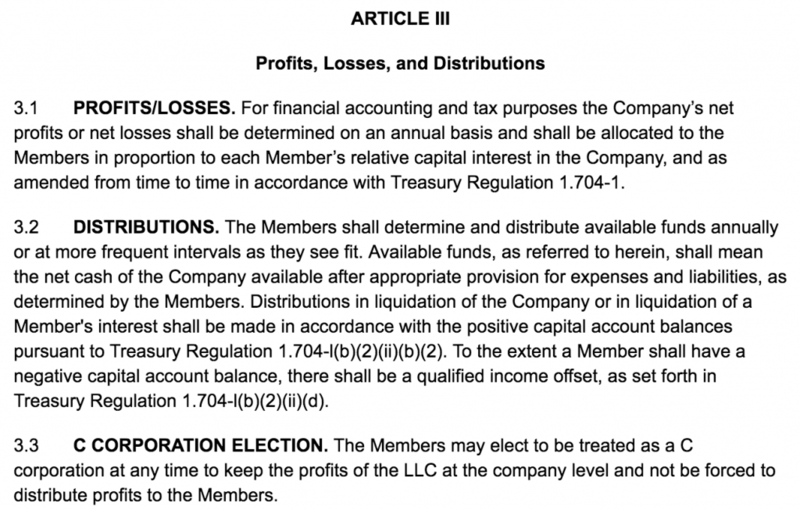 Article III details how profits and losses will be shared among members. Generally, profit allocation in a multi-member LLC is determined based on each member’s ownership percentage as identified in Exhibit 1 of your operating agreement. However, operating agreements give you the flexibility to change percentages and determine when profits will be distributed to the members. A company’s profits and losses are the money raised and lost in a given year. These amounts can be shared between LLC members depending on their ownership interest or other factors identified in your operating agreement. Document how profits and losses will be shared in your operating agreement in case anyone’s financial responsibilities are questioned. As the sole member of an LLC, you’ll receive 100 percent of profits and bear 100 percent of losses. However, with a multi-member LLC, it’s more important to detail the sharing of profits and losses in your operating agreement. List members in the agreement and identify their portions of profits and losses, making sure that everything adds up to 100 percent. Generally, percentages align with each member’s ownership interest in the LLC, but you can choose any numbers if your members agree. LLC members don’t receive a salary for the work they do for the company. Instead, they receive distributions based on the company’s profits and losses. Use your LLC’s operating agreement to determine if your members will receive distributions quarterly, annually or at another frequency that makes sense for your company. If you want to keep a flexible distribution schedule, include language in Article III of your operating agreement specifying that available funds should be determined and distributed annually or at more frequent intervals as the members see fit. Be sure to have your distribution schedule reviewed by a certified public accountant or tax attorney to make sure you’re meeting IRS regulations and filing the necessary forms. The default LLC tax structure is that of a sole proprietorship or partnership. However, under certain circumstances, you can change your tax structure to that of a C corporation or S corporation by filing with the IRS. Whether you’ve already filed your LLC with the state or are planning to organize in the future, include the appropriate language in Article III of your operating agreement. Sole proprietorship/partnership taxation: By default, LLCs are taxed as sole proprietorships or partnerships, depending on the number of members. This means LLCs don’t pay their own taxes because profits are reported on individual member tax returns. If you plan to retain the default taxation structure for an LLC, you don’t need to include any specific language in Article III of your operating agreement. Corporate taxation: In contrast, corporations pay taxes twice: once on corporate net profits and again on dividends as part of members’ personal tax returns. You can elect for your LLC to be taxed as an S corporation or C corporation, which offer distinct advantages under certain circumstances. Consider corporate taxation if your members have business responsibilities that aren’t aligned with their ownership shares. Check out our comparison of LLCs, S corps, and C corps to help decide what’s right for your LLC. If you think you may want your LLC to be taxed as a corporation in the future, include language in Article III of your operating agreement to give yourself this option. Do this by stating that members may elect to be treated as a C corporation at any time. The differences between LLC tax structure are very nuanced, so consult with a tax professional to help you decide what’s best for your company. Check out our small business owner’s guide to LLC taxation to determine the best tax structure for your company. Screenshot of LLC Operating Agreement Template Article III. Choosing your LLC’s profit distribution and tax structure will have a substantial impact on your company’s finances. We recommend hiring an attorney or tax professional to help you make financial decisions for your LLC. However, if you want to save money on hourly attorney or CPA fees, check out Rocket Lawyer’s monthly membership plan and consult with one of their On Call attorneys. The majority of management-related language goes in Article IV of your operating agreement and depends on how your LLC is managed. 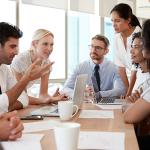 In member-managed LLCs, all of the members can make decisions; manager-managed LLCs restrict management to managing members or a third-party manager. Include language specific to your management structure in Article IV of your operating agreement. A member-managed LLC gives every member authority to bind the company. Under this structure, all of your company’s owners can open bank accounts, sign contracts and make other decisions that bind the company. Choose this structure if you’re comfortable with all of your LLC’s members playing a role in the day-to-day management of the company. If you have a single-member managed LLC, Article IV of your operating agreement will be brief. This section should state the member’s powers, that the member will manage the LLC, and that the member has powers to sign contracts, set up bank accounts and otherwise bind the company. Also, include language affirming that the member’s liability is limited pursuant to applicable law. Finally, include boilerplate language for administrative matters as detailed below. If you have a multi-member managed LLC, the management section of the operating agreement should include terms detailing member duties, dispute resolution between members and accommodation of members who wish to sell or otherwise transfer their interest in the company. Management of the business: State that management of the business is invested in the members. Also, explain that the members will appoint one chief executive member who will have the most responsibility and be head of operations for the business. Members: Limit the liability of the members and specify that members may take part in the control, management, direction or operation of the company’s affairs and have powers to bind the company through contracts and other obligations. Duties of members: This section does not detail each member’s duties. Instead, it should state that each member should have duties and describe what will happen if a member doesn’t meet those duties. Chief executive member: A chief executive member is the member who has primary responsibility for managing the operations of your company and for making member decisions happen. This section is not necessary if you have a single-member LLC. In a manager-managed LLC, only managers and designated officers have the authority to bind the LLC. A manager can be a group of members with management authority or a third-party hired to manage the company. Choose this if you’d like to limit management authority to a group of your members or if your business will benefit from a non-member manager. Generally, the manager-managed structure is best for larger companies, and member-management is better suited to single-member LLCs. However, it may be appropriate to consider a manager-managed single-member LLC if you own a retail business or other company that will necessitate hiring individual store managers. Consider the needs of your business and determine the appropriate management structure accordingly. If you opt for a manager-managed structure, the management portion of your operating agreement won’t depend on how many owners you have. Instead, the operating agreement should include a section specifically outlining the duties of the manager. Management of the business: State here that the LLC is manager-managed and indicate that the managers are named in the Articles of Organization you filed with the secretary of state when you created your LLC. Also, include how managers will be appointed. For example, you can decide that members holding a majority of the capital interests in the LLC may elect managers. Members: This section should state that members shall not take part in the operation of your company’s affairs unless they are elected managers. Screenshot of LLC Operating Agreement Template Article IV. Choosing a management structure is one of the most important parts of setting up your business. Your management structure will also determine the content of your LLC operating agreement, so it’s important to select the correct structure. Rocket Lawyer’s nationwide team of On Call attorneys can help you choose a management structure and draft an operating agreement for your LLC. Regardless of your management structure, there is specific boilerplate language you should include in Article IV to protect your LLC and its members from third-party legal action, bankruptcy or regulatory action. If you have a multi-member LLC, include language regarding indemnification, recordkeeping requirements and how members can access company records in Article IV of your operating agreement. Disputes of members: This section should state that disputes among members will be decided by a majority vote. Include this only if you have a multi-member LLC. 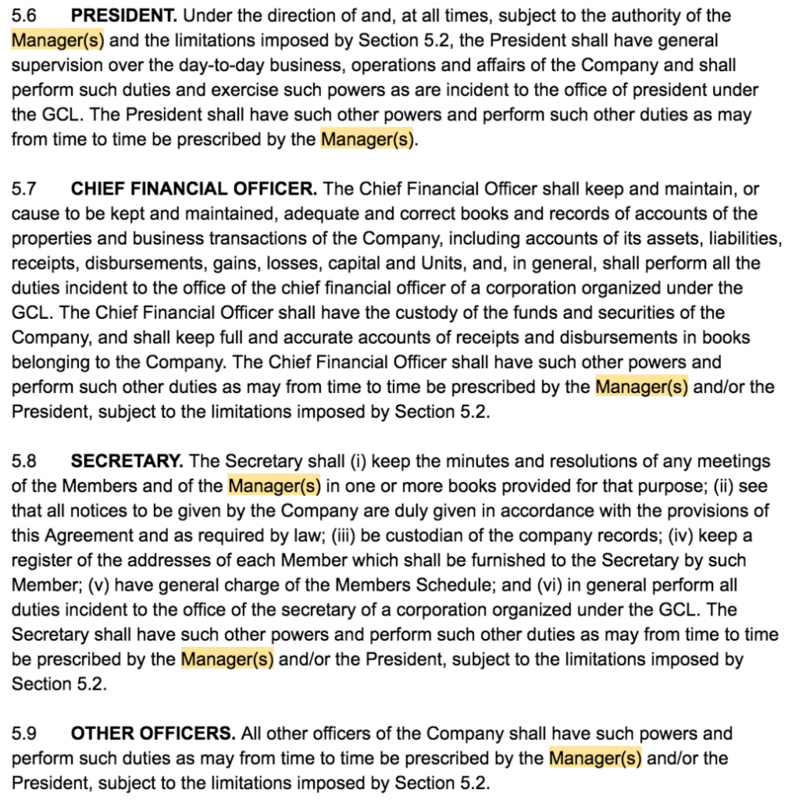 Powers: This section describes the powers of an LLC’s member-managers or manager-managers. Include details about whether members/managers can enter into contracts, buy property, take out loans or otherwise bind the company. Include this only if you have a multi-member LLC. Nominee: A nominee is a third-party public representative for an LLC that allows an LLC to own property without it becoming public knowledge. This section states that title to the company’s assets should be held in the LLC’s name or in the name of a nominee like an attorney or title company. Company information: An LLC’s members should have access to all books, records and materials regarding the LLC’s activities that are in a member or manager’s possession. Include this section to describe the rights of members to access, inspect and copy these records in Article IV of your operating agreement. Exculpation: An exculpation clause relieves an LLC’s members or managers from liability to the members for damage caused by actions taken in good faith and to promote the best interests of the company. Indemnification: This section states that the LLC will compensate members or third parties acting on behalf of the company for harm, liability or losses stemming from their good faith actions with respect to the company. Records: Retain copies of your member names, certificate of formation, operating agreement and financial records. Reference IRS regulations or consult a CPA or tax attorney to determine how long to keep records and include the time period in Article IV. Determining the appropriate management structure for your LLC can be a difficult decision. We recommend hiring an attorney to help you organize your company. If you don’t want to spend money on hourly legal fees, sign up for Rocket Lawyer’s membership program for $39.99 per month and their network of On Call attorneys can guide you through the process. Your LLC isn’t required to have officers. However, you can provide structure to your LLC by creating titles and detailing relevant scopes of work. 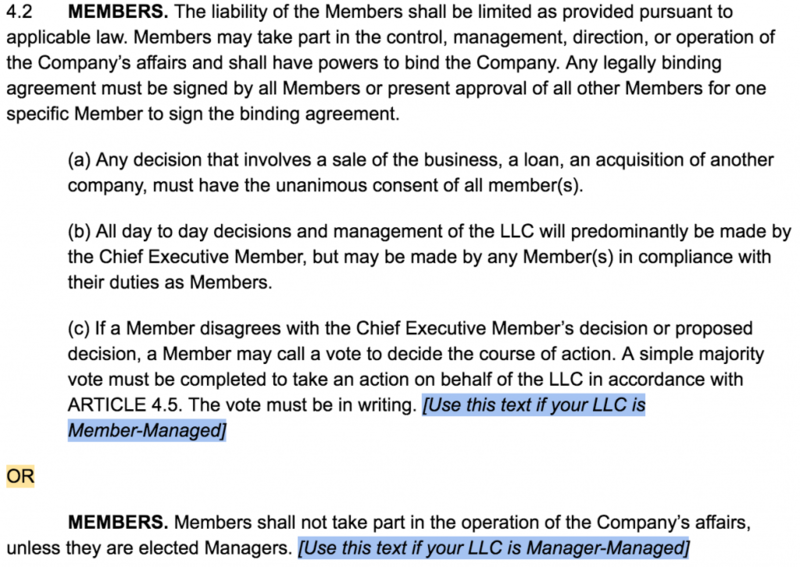 If your LLC has members or employees who’ll take a leadership role in the company, use Article V of your operating agreement to identify what they’ll do and how they’ll be selected. 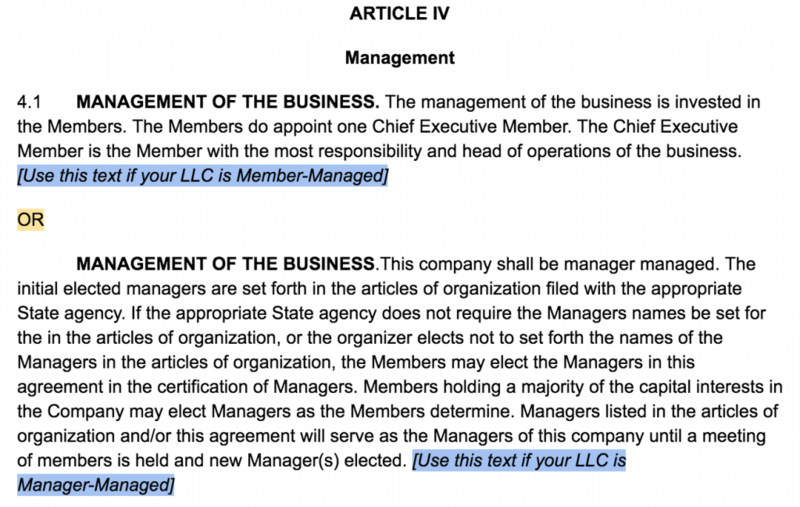 Screenshot of LLC Operating Agreement Template Article V.
President: The president of your LLC must be a manager of the company and will be responsible for guiding the high-level operations of the LLC. Chief financial officer: Your LLC’s chief financial officer will keep and maintain books and records of accounts of the properties and business transactions of the LLC, including accounts of its assets, liabilities, receipts, disbursements, gains and losses. Vice president: A vice president can be an owner, manager, or employee responsible for the operations of a specific department within your company like sales or finance. Secretary: An LLC secretary is charged with preparing and filing annual reports, taking meeting minutes and other record-keeping responsibilities. In addition to describing each of the roles, include sections in Article V about general duties, how officers will be appointed, the extent of their decision-making authority, how they’ll be compensated, and how the LLC will fill open officer positions. You should also create an exhibit to the operating agreement that lists the names and roles of each officer at the time the agreement is executed. 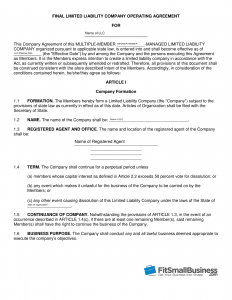 Screenshot of LLC Operating Agreement Template Exhibit 3. An LLC’s compensation structure determines what managers will be paid and how members can draw against their ownership interest. Use Article VI of your operating agreement to restrict when a member may take draws and how managers will be compensated for services. You don’t have to restrict member draws but always provide information regarding manager compensation. LLC managers are typically reimbursed for out-of-pocket expenses related to LLC management and compensated for time spent performing LLC management responsibilities. If you would like to control how your LLC’s managers are compensated, include language in Article VI of your operating agreement that limits payment to reimbursement and compensation commensurate with the value of management services. Instead of being compensated for their work in the company, LLC members have a capital account. However, in addition to receiving distributions, they can opt to receive a “draw” of funds from their capital account. Include language in your operating agreement to specify when and how draws may be made. Screenshot of LLC Operating Agreement Template Article VI. Your LLC should maintain detailed financial records to meet state and federal tax requirements. If you’re a multi-member LLC, you’ll also need to keep records of capital contributions and member accounts. 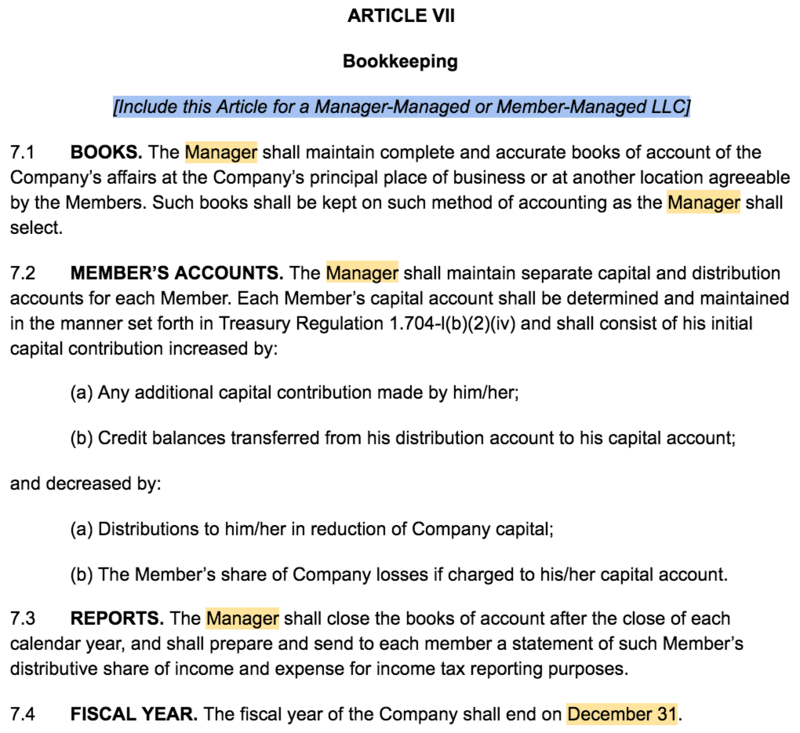 Choose a fiscal year and use Article VII of your operating agreement to detail how to prepare and maintain your books and track member accounts. An LLC’s books are used to track the company’s day-to-day affairs and prepare balance sheets and other financial statements. Keep complete records in your company’s ledger to track income expenses, loans and other debt. Include general language in your operating agreement to require that members or managers maintain complete and accurate books. You should also keep a record of members’ capital account and distributions. Bookkeeping requirements for member accounts are dictated by federal regulations, so reference these to ensure you’re including the necessary details in your operating agreement. Incorporating these terms will help your LLC comply with tax requirements and prepare you if the LLC is sold. After the close of each fiscal year, your LLC must also prepare statements of each member’s share of profits and losses and provide them for their individual tax returns. Include a section describing these requirements in your operating agreement to ensure your members and/or managers are aware of the reporting requirements. Unlike a calendar year, an LLC’s fiscal year is 12 consecutive months ending on the last day of any month. This date determines when your year ends for accounting purposes. Choose a fiscal year that works for you, but you must continue this timeline every year, and it can be difficult to change. Screenshot of LLC Operating Agreement Template Article VII. Article VIII of your operating agreement should include procedures for transfer of shares in case of a member buyout or the company’s dissolution. Buyouts involve members selling their ownership shares, whereas dissolution occurs when an LLC goes out of business. Control how membership shares are treated in these situations by describing procedures in your agreement. Use Article VIII of your operating agreement to describe how shares will be assigned from an exiting member, how an exiting member’s interest will be valued for the purpose of a transfer and how the member’s interest will be distributed and reimbursed. Much of this language is boilerplate, but it’s important to describe how long members will have to purchase an exiting member’s interest and what happens to a former member’s debts upon dissolution of the company. Screenshot of LLC Operating Agreement Template Article VIII. To make an operating agreement a binding contract between members and/or managers, it must be signed by every member of your LLC. Once signed, provide copies to each member and manager and keep the original on file at your principal place of business. Always check with your secretary of state regarding specific filing or recordkeeping requirements. Screenshot of LLC Operating Agreement Template Certificate of Formation. Drafting and executing an LLC operating agreement can be an extremely nuanced process, and it’s important to make sure the document is properly executed. In addition to helping you draft an agreement for your company, Rocket Lawyer’s On Call network of attorneys can help make sure your LLC documents are enforceable legally. An operating agreement is a legal contract among members and between members and managers of an LLC. Operating agreements provide stability to LLCs by formalizing ownership shares, profit-sharing, voting rights and other parts of the business. Once signed by all of the LLC’s members, it becomes a legally binding contract defining how the company should operate. Defining important terms of your company’s operating will help your LLC survive if disputes arise or a member chooses to leave the company. An LLC operating agreement also enables companies to avoid the default rules states impose on companies that don’t have an agreement on file. Include all of the relevant information in your operating agreement so you can find it easily if a problem arises. In the absence of state requirements, operating agreements are best for multi-member LLCs or LLCs with employees. However, your LLC will be subject to default state laws if you don’t have an operating agreement on file, so we recommend that every LLC have one in place. It’s best to hire an attorney to assist with important legal documents, but you can save money by using our templates to draft a simple LLC operating agreement for your company. States don’t require LLCs to file operating agreements with the state formally, but some require LLCs to keep one on file. Even if your state doesn’t require an agreement, the document is a great way for any LLC to formalize operations. Check with your secretary of state to determine if you’re required to have an operating agreement. There are pros and cons to having an operating agreement for your LLC. Because you aren’t required to file an agreement in every state, decide whether drafting one is worth the added costs. If you have the time and resources, execute an operating agreement to formalize important elements of your business and avoid state-specific default rules. Minimize management disputes: Where an LLC has more than one member or Manager, it’s important to detail voting rights early on. This can be accomplished by including voting rights and the scope of manager authority in an operating agreement. Avoid default state laws: Every state has default laws to control how LLCs operate in the absence of an operating agreement. File an operating agreement to avoid these default laws and the uncertainty that comes with them. Quickly resolve disputes: Operating agreements are a great way to establish your preferred methods of dispute resolution. Decide how you want to resolve intercompany disputes and include the terms in the agreement. Prepare for possible dissolution: If a member dies or decides to leave the LLC, you’ll have to reallocate ownership percentages. Detail how this will be done in your operating agreement to prevent an unwanted dissolution of the LLC. Expensive to draft: Using an attorney to draft an operating agreement can be expensive. Avoid these added costs and provide structure to your company by using one of our free LLC operating agreement templates. Time-consuming: Drafting an operating agreement requires you to consider how you want certain business decisions to be made before issues arise. This can take time and energy you may not have when first forming your LLC. Restrictive: Depending on the terms you include in your LLC’s operating agreement, you may find that complying with things like meeting requirements restricts your ability to operate efficiently. The format and content of an LLC operating agreement change depending on the LLC structure and state of organization. In addition to checking with your state’s requirements, follow a standard format to ensure your agreement is comprehensive and understandable. Use our simple LLC operating agreement templates to create an agreement that meets your LLC’s needs. Single-member LLC operating agreements serve to separate the member from the LLC for liability purposes and supersede state default rules. They are also an excellent way to establish the duties and compensation of a third-party manager. Select this template for your single-member LLC and choose the language appropriate for your management structure. 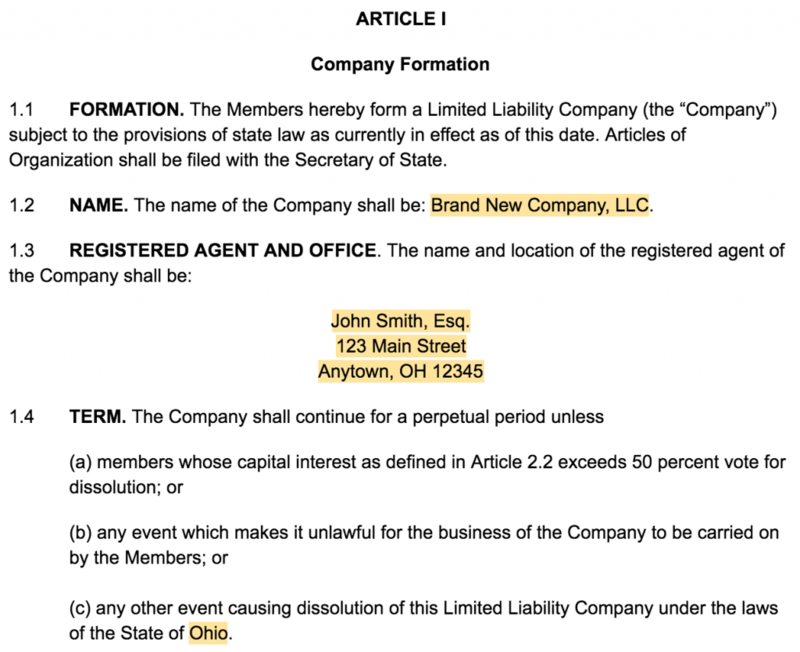 Screenshot of Single-Member LLC Operating Agreement. An operating agreement for a multi-member LLC includes many of the same terms as a single-member operating agreement, like primary place of business and registered agent. However, this template is more detailed than the single-member template because it’s aimed at making interactions between members more predictable. Screenshot of Multi-Member LLC Operating Agreement. An LLC operating agreement is a legal contract among the members and between the members and managers, of an LLC. It defines the scope of the LLC and dictates how the company will be operated. An LLC operating agreement commonly includes details like how to share profits, voting rights and how the company may be dissolved. Do You Have to Have an Operating Agreement for an LLC? No state requires an LLC to file an operating agreement with the secretary of state. However, some require LLCs to keep an agreement on-file. Additionally, states have default rules for LLCs that apply in the absence of an agreement. Execute an operating agreement to provide structure to your company and avoid the uncertainty of default rules. Do You Need an Operating Agreement With a Single Owner LLC? Operating agreements are most helpful for LLCs with multiple members or employees. However, single-member LLCs should also have an operating agreement to differentiate the owner from the business for tax purposes and to avoid state default rules. Check out our LLC operating agreement templates to draft one for your small business today. What’s the Difference Between an Operating Agreement and Articles of Organization? Your LLC’s articles of organization is the document filed with the secretary of state to create your LLC. 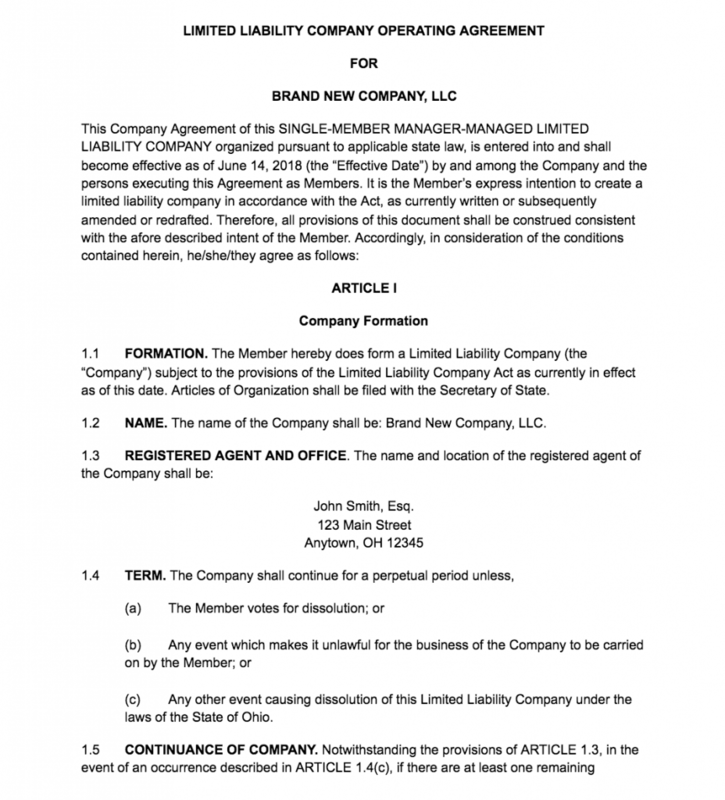 The contents of this document vary by state but generally include the LLC’s name, business purpose and owners. In contrast, an operating agreement is drafted after your LLC is formed and details your company’s organization and management. LLC operating agreements aren’t required everywhere but are an excellent way to formalize your LLC’s structure and avoid the uncertainty of state-specific default rules. The content of your operating agreement will differ depending on your LLC’s ownership and management structure. Determine your company’s needs and choose a simple LLC operating agreement template that works for you. LLC operating agreements are nuanced, state-specific documents, so we recommend hiring an attorney to draft one for your company. However, attorneys can be expensive, and some companies like single-member LLCs require less complicated operating agreements. If you don’t want to spend money on an attorney, check out Rocket Lawyer for help with your LLC operating agreement.